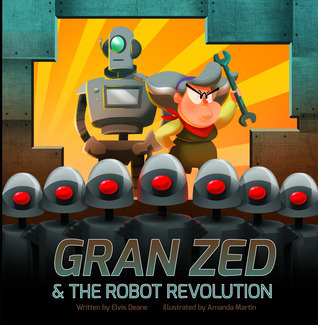 We’re giving away 20 copies of the iBooks version of Gran Zed. Just retweet the tweet or like the Facebook page and you’ll be entered to win Gran Zed & The Robot Revolution on your iPhone, iPad, or iPod. This is how Rob-0 came together after those initial design studies- a little more broad in the shoulders and some brown in the tone of his metal. Here’s the commercial that I shot on Friday, starring Liz Nascimben as Gran Zed. A link follows to the video preview of the book. I shot a commercial this week that will be going up on Youtube soon to promote the book. Here are a few images. Here’s a look at some of Amanda’s initial desigins for Rob-0 the robot. Before she began working on rough sketches for the illustrations, artist Amanda Martin sent these sketches as a test of what Gran Zed might look like.